"Django Unchained" is a blood-soaked, blackly funny, slavery-era extravaganza of a film, compliments of Quentin Tarantino. It is a movie populated with great actors delivering great dialogue, with some great gore and not one but two epic shoot-outs at the end to top it off. Django (Jamie Fox) is a slave who was separated from his wife, Broomhilda Von Shaft (Kerry Washington) as punishment when the two tried to run away together from their plantation. 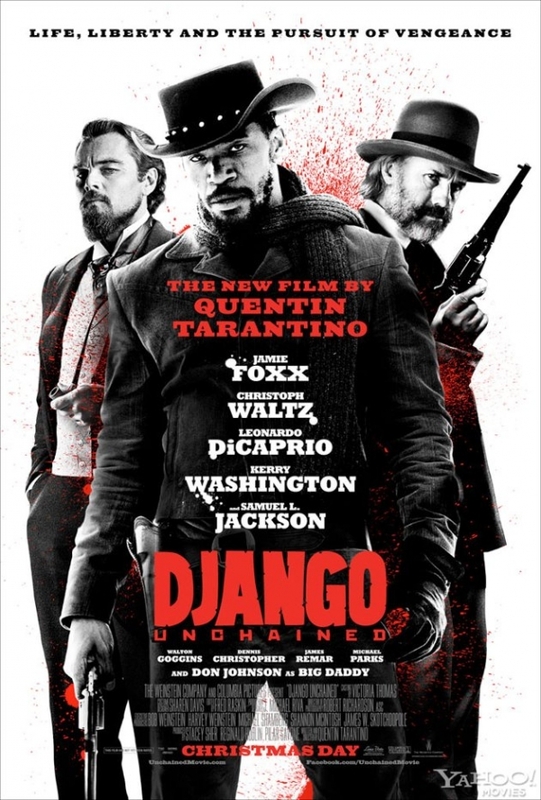 Forced to walk shackled to a horse, under harsh winter conditions, Django is surprised to encounter eccentric "dentist" Dr. King Schultz (Christoph Waltz), who turns out to be a skilled bounty hunter. 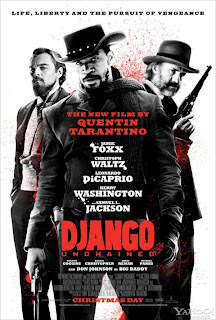 King Schultz acquires Django under strange and bloody circumstances, and offers him a proposition: Django will earn his freedom if he helps King to identify three slavers who are wanted dead or alive. Thus begins a blood, unusual adventure as the two seek out outlaws and ultimately attempt to save Django's wife from Calvin Candie (Leonardo DiCaprio), a sadistic and insane slaveowner. Christoph Waltz, who proved his acting chops playing opportunistic SS officer Col. Hans Landa in Tarantino's 2009 film "Inglourious Basterds," shines here as charismatic and mysterious King Schultz, who seems to have his own strange code of ethics. Jamie Foxx is good and Kerry Washington excels playing a fairly uninteresting character, but the biggest surprise is DiCaprio. Nothing of 90's heartthrob Leo is present as slimy, venomously evil Candie, like "What's Eating Gilbert Grape?" It's a total transformation. Tarantino delivers as he always does: clever dialogue, creative shots, and gallons of blood. On a side note, although no movie could accurately portray the horrors of slavery, this film gets pretty far out of people's comfort zone, which is more responsible for the controversy than any alleged racism. If you like Tarantino, you will like this strong entry into his cinematic universe. I am planning to watch this this weekend, even though my wife has no desire to see it. I'll watch it while she's at work. She's watched other Tarantino, but wasn't a fan of Bastards. We both loved Kill Bill (both parts) and liked Pulp Fiction and Reservoir Dogs. I've been waiting to see this for a long time...can't wait to be able to see it finally. Very happy that you enjoyed this one. It's a great Tarantino film. Waltz's Schultz just got me every time and I loved the story they told with his character. As important as Django's own story. Yeah it had its faults, (most notably Tarantion's cameo) and it certainly isn't for anyone sensitive to slavery and racism, but it's a good, fun film! I loved the film, but I agree that some parts felt excessive. Still, the cast, dialogue, soundtrack, and direction were pretty amazing. I certainly would give this a rent, though at almost 3 hrs long I have to find a good timing that works to catch it. Not my favourite film by him, but I still loved it! Although, without Waltz beside him, Jamie Foxx would have fallen apart.